Just A Taste of January! A restaurant that embodies warmth and sophistication and offers a plethora of seafood, has my name written all over it. That’s why an invitation to dine at Tortoise Supper Club had me super stoked. The restaurant has graced the River North food scene since 2012 and is now a tourist and local favorite. You’ll see why the minute you walk in, with mahogany wood interiors and smiling staff ready to welcome you. My friend and I also lucked out by being seated in their Red Room Library and with the nicest server. The menu is comprised of mostly classics but with a stylish spin, and cocktails concocted around Chicago’s historical stories. I picked the All Spice Margarita to induce my appetite, which did just that. If there’s a raw bar, I’m ordering from it. We got an assortment of east and west coast oysters on half shell, which came with a highly refreshing cucumber mignonette amongst other condiments. The chilled Gulf Shrimp Cocktail made the perfect pair with the Bloody Mary cocktail sauce it came with. One of my favorites from dinner that I’ve also never had before was their Baked Oysters Rockefeller Dip. The appetizer was topped with a mixture of Parmesan breadcrumbs and green herbs, and copious amounts of butter. Baked golden brown and served with toasted sour dough, ready for us to devour. We changed course with soup. 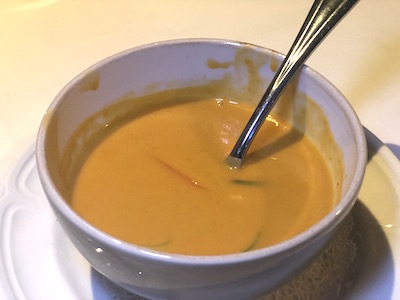 The Lobster Bisque on special that evening was rich and well seasoned with hints of brandy and sherry throughout. There was also a good amount of cayenne in the broth, but a little spice hurt no one. Portions are large here so we knew that if we didn’t move on to the entrees, there wouldn’t be any room left. The Pan Seared Branzino and the Red Snapper were ordered immediately. The latter was garnished with a lobster claw and together with the fillet placed on a bed of saffron risotto and roasted Maitake mushrooms. I am so glad I am eating leftovers as I write this. The Branzino was smooth in a lemon butter caper sauce and just nicely executed. The whipped mashed potatoes it came with were utterly and butterly delicious. For dessert we tried their Cherry Pie with Michigan tart cherries and strong hints of almond essence, which matched well with the sweeter Tortoise Pie with a bourbon-caramel sauce. I licked the spoon clean with every bite, because I couldn’t imagine wasting even a speck of that decadence. With such a remarkable meal, there was only one thing to do- go home and go to bed. I dreamt sweet dreams of a fine dining experience and was glad that my 2019 food adventure had been off to such a terrific start! When life hands you an opportunity to “pig out” order seafood. And what I mean by that, is don’t be fooled by the name, The Purple Pig, located on the magnificent mile in Chicago. One of my favorite restaurants in the city, I had the pleasure of revisiting The Purple Pig recently. I went in to try some new menu options, and was once again reminded of how vegetarian and pescetarian friendly this eatery is. Heralded under the leadership of the very talented Chef Jimmy Banos Jr., son of acclaimed Chef Jimmy Banos, along with Sous Chef, Kevin Stack and cocktail director Alan Beasey, this restaurant sure dominates the Streeterville scene. Of course, the sheer number of accolades it has received should probably give it away, but you should decide for yourself. In fact, I dare you to go any day of the week and not find it packed; a pure testament to its popularity and subsequently the quality of food. No matter what kind of mood you’re in, I can assure you that the Purple Pig will instantly add excitement to your day. Cocktail offerings have drinks such as The Pastoral, which had Letherbee gin, Three Cents lemon tonic, star anise, sweet oregano and orange, and was simply exquisite. And the wine list is so extensive, you’ll be be sure to be overwhelmed, yet simultaneously impressed. The new Bobota Greek Cornbread with feta, Mizithra cheese and honey is the best sweet and salty appetizer I have had in a while. And the cornbread is just one example of how the restaurant constantly aims at blending Italian, Spanish, and Greek flavors in every dish. So many vibrant flavors coming together to create a unique taste. The Deviled Egg definitely had my jaw dropping. I always love when a classic is presented with a creative take. It came fried on a bed of arugula and caper berries adding an intense brine to go with the blander egg. The egg was steaming hot when I cut into it and it was definitely the most dramatic deviled egg presentation I have seen. I was happy to see that my most ‘favoritest’ dish, the Orange and Olives Salad was as good as I remembered it. You know I had to order it just to double check. Chef whips his magic with Cara oranges, green olives, olive vinaigrette and caramel all mixed together. There were also some Fresno chilies in there for a little heat. Would you believe me if I said I ate the whole platter? Wait, don’t answer that! The advantage for foodies at The Purple Pig is that no dish leaves you feeling too full or guilty because of just how well it is balanced it is with greens, fruits, and vegetables. But I guess that could also be a dangerous thing, because you wouldn’t want to stop eating. Another new item on the menu that caught me by surprise was, the Grilled Broccoli. Now you may wonder what the big deal is with broccoli or you may not be a broccoli lover at all. Worry not, because I have now learned that broccoli when combined with roasted garlic and anchovy vinaigrette is so yummy that it will make you an instant believer in this green flower. Believe me when I say, this simple vegetable dish was dreamy, and the best broccoli dish I have had. Then came the Grilled Shrimp with an apple and sherry sauce, made without the Mortilla (blood sausage) for us. I can’t speak for you meat lovers, but for me, this dish was perfect as is, and I certainly couldn’t tell it was missing anything. The Scallops should never be taken off the menu, period. Pillowy soft fish with butternut squash, pepitas, navy beans and a citrus beurre blanc. Strong fall and winter flavors all around. Vibrant in appearance and taste. The finale was when Chef Kevin stopped by with a bowl of three giant truffles, telling us how he had called his “truffle dealer” only minutes before to deliver fresh truffles to the restaurant, so that he could shave them tableside for us, onto the Ricotta Gnocchi we had ordered. Darn right I felt special! Both the gnocchi and the truffle melted on my tongue, while the aroma still lingers in my nose. Thank you Chef, but you may have ruined any other pasta dish for me going forward. And as if that wasn’t decadent enough, we proceeded with dessert. The Brown Sugar Cheesecake is indeed remarkable and should not be missed on a visit here. I will pray for you that it is still on the menu. I don’t mind affirming that The Purple Pig is one of my top three favorite restaurants in the city and you know I eat out a lot. There is nothing I haven’t liked here or haven’t raved about. For being so busy, their service is always on-point and all servers essentially work for all tables. I guess, teamwork does make the dreamwork! Go visit The Purple Pig and give your 2019 the awesome culinary beginning it deserves! Printers Row has always been one of my favorite neighborhoods in Chicago, especially given its historic charm. Naturally, I am pleased when anything helps ameliorate its scene and brings more people to it. Thanks to new restaurants like Half Sour that are making more Chicago residents aware of what this area has to offer. Half Sour is a neighborhood bar and eatery which opened last year and has quickly become a local favorite for people of all ages. This month, thanks to an invitation from owner Emily Bloom, had the privilege of stopping in for a menu tasting with my friend Matt and enjoy a wonderful Wednesday evening devouring delicious food. While restaurant-bars in general have upped their game, I am usually prepared to do my fair share of carb and grease-loading when I visit one. Much to my dismay, the menu at Half Sour offers many light and gourmet dishes so you can enjoy your meal guilt-free (if you choose), or enjoy your cheese curds if indulgence is on your agenda. I’m also a sucker for places that do daily specials, and although beer is not my thing, if it is yours, you’re in luck here. $2 off any draft beer on Wednesdays! I opted for the Hot Tami, a version of Hot Toddy, only better, with chamomile tea and fermented honey. I could’ve drank a few of these, but I didn’t think that was the day for me to test my tolerance to whiskey. Such a perfect winter cocktail to warm your stomach before dinner. For food, we started with the Fried Artichokes and the Pumpkin Hummus. I always enjoy a hot and cold combination for starters, and both were recommended by our server. I don’t care what fried ‘stuff’ you serve me, if the garlic aioli is good, I’m sold. Needless to say the aioli was fantastic and artichokes fried golden brown. The feta in the hummus nicely meshed with the pumpkin flavor in the dip. And nothing like ordering a salad to mitigate any guilt after polishing a big bowl of fried artichokes. The Salmon Spinach salad was my obvious choice. The problem is, that when the salad is also delicious and you devour it, it beats the purpose of why you ordered it in the first place. But that’s a testament to good food, I guess. The lemon-dill dressing was delightful with the greens, as was the fish. For entrees, we ordered their Cauliflower Steak as I always like to see how a restaurant cooks its vegetarian fare. This dish was too good to be true. And a large portion too. Seasoned cauliflower placed in Harissa hummus and almond butter, with pickled pomegranate drizzled throughout. A filling alternative to any meat dish I would say, and satisfying in every way. The other entrée was Salmon, because a seafoodie can never get enough salmon. And likely, the most perfectly cooked salmon I have eaten. The faro and rye bread puree were really interesting and gave the dish personality. I would absolutely go back just to eat this dish. You’ll be proud of me because I skipped dessert, but only because I was too full so I’m not sure I am worthy of your admiration, yet. Seriously, this place is amazing. It’s unassuming, low key and offers versatility in food and drinks. Give it a go! There’s no question how good food can put you in a good mood, no matter what. By ‘what’ I mean, the weather. The weekend I visited Ethiopian Diamond was a cold, dreary and stormy one. Owner Almaz Yigizaw couldn’t have picked a better time to invite me in for a tasting. Plus, I love Ethiopian food, which also reminds me of Indian food. The restaurant located in the heart of Edgewater presents traditional interior design and the most welcoming atmosphere to anyone, whether they are familiar with the cuisine or not. And my weekend was definitely in need of some exoticness, so this was all perfect. My guest and I walked in to be welcomed by many smiling faces and a bustling crowd on a Sunday evening. For those not familiar with this delicious fare, it generally consists of vegetable and meat dishes cooked in a thick stew and served atop a large, sourdough flat bread called Injera. The bread itself is made out of fermented teff (ancient Ethiopian grain) flour and served on a giant, communal platter. The thing about Ethiopian food is that you have to be prepared to get down and dirty, eat with your hands to savor the full flavor of the food, and believe that sharing is caring. We first started with hot Ethiopian tea to warm our insides. The cardamom flavors were simply amazing as I poured myself cup after cup. Immediately following, were the Sambusas, fried little pastries stuffed with lentils, meat, spinach and infused with niter kibbeh (spiced clarified butter) frequently used in the cuisine. These made for addictive starters. I was trying the Yemisir Azifa for the first time. A salad of cooked lentils, chopped onions, green peppers, tomatoes and a delicious Ethiopian hot mustard. Ah the flavors and the freshness! The sampler platter finally arrived with an assortment of different lentil, vegetable and seafood stews served on the Injera. Every dish exuded striking flavors, and was tastier knowing they were made using only local ingredients and authentic Ethiopian spices. The Asa (fish) Wat, made in their special “diamond berbere” sauce had an exotic, mildly bitter taste. The tilapia was cooked to perfection and amassed all the spices in the sauce beautifully. The color on this dish was enough to make you want to lick your fingers. We ate until we could eat no more. And yet proceeded to order their Chocolate Lava Cake along with Ethiopian Coffee. With a meal like that, you start and end with caffeine. But it’s different, because even their warm beverages are made intricately and with much love. Ethiopian food has character. I feel like every dish and every morsel leaves a long lasting effect on your senses. And while I’ve had good Ethiopian food in other restaurants around the city, I loved that Ethiopian Diamond actually offers seafood as an option. A whole section dedicated to fish! Its nice when pescetarians aren’t left out. Beyond dining in, Ethiopian Diamond also caters and delivers, so if you’re craving some spice on a dull weather day, you can phone in. If you haven’t been here yet, you should go, and if you haven’t had Ethiopian food before, start here! We can all agree that it’s been a cold month. And I don’t know about you, but the cold always makes me crave hearty Italian food. Dinner at Osteria Via Stato came in time to beat the cold with some delicious carbs. This Lettuce Entertain You restaurant actually came about as a result of owner Rich Melman’s visit to Italy, and his vision reflects that through and through. The rustic Italian décor, candle lighting and artisanal fare will instantly take you on a journey through the Italian countryside without having to board a plane. And for those of you who don’t know, there is a pizzeria on the other side of the restaurant. And this visit was extra special as it was my friend’s birthday. You know I love birthdays! We were starving when we arrived and immediately seated in one of the best seats in the house in a little nook set with a table for two. We didn’t waste a minute before reaching out for a piece of that fresh, warm bread they serve with a side of roasted garlic in balsamic. How yummy! Our server was wonderful, very knowledgeable and eager to please. He highly recommended their Rhode Island Style Spicy Calamari and Shrimp. A platter of lightly fried and breaded seafood with roasted red peppers. The pasta had been calling my name from the moment we sat down. Our server also mentioned how the house-made and hand-rolled gnocchi came in rosemary butter and my response was, “done!” I couldn’t believe how light and airy the gnocchi was and learned quickly that the restaurant doesn’t use potato in the filling, which is made entirely with ricotta. Guys, ricotta gnocchi is the way to go! The Ricotta Cavatelli didn’t lag behind either. Tender pasta with wild mushrooms was simple and elegant. The entire dish was cooked in a parmesan broth which provided a light brine to each bite. I may just have the best pasta-picking skills in the world! From their Specialties section of the menu, we ordered the Seafood Stew and the Scallops. If you’ve been following my journey, it should be no news to you that Seafood Stew of any kind is the key to my heart. And bonus points if it shows up on a cold night. The broth here was rich and came with seared scallops, white fish, scallops, and shrimp. The flavors were aromatic and while it did have a spice note, it wasn’t overpowering. With the toasted ciabatta bread, mopping the gravy was even more fun. The Scallops were my favorite bite of the night. Beautifully and delicately seared scallops with roasted Yukon gold potatoes and wild mushrooms bathing in a light lemon cream sauce. Any writer would find it difficult to effectively capture the true brilliance of this dish. My advice to you is that no matter what you get here, please end your meal with their Warm Apple Crostada which comes with caramel sauce and a scoop of vanilla gelato. It is divine. If you noticed, I skipped on drinks this meal. While they do have an extensive wine and cocktail list, it is sometimes nice to focus solely on the food. Osteria Via Stato is a staple in our city, whose food doesn’t really any introduction, yet I want to tell you that it is one of the best we have in Chicago and that you must visit!